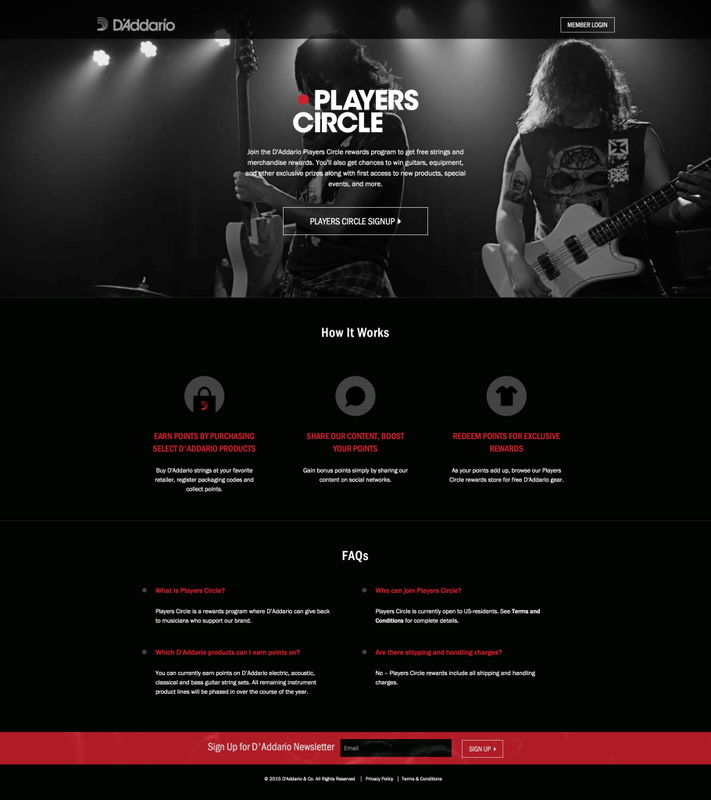 Learn how we used Magento Enterprise to custom-build D’Addario’s loyalty program, the Players Circle, to engage with and delight customers. Family owned and operated since 1918, D’Addario has continued to manufacture instrument strings that have delighted musicians and developed devoted customers along the way. The passionate product makers at D’Addario love making their strings almost as much as they love their customers, and wanted to create a way to engage their customers without disrupting their retail partners. For years, D’Addario’s rewards program consisted of a disconnected and slow process for users. In order for brand-loyal customers to redeem points for their D’Addario purchases they would have to download and print a PDF form, fill out what products they purchased along with serial numbers of each product, mail the form in and wait for D’Addario to mail back items for which they could redeem their points. Moving forward, D’Addario realized it was important to create a more streamlined experience to make it easier to reach a variety of customers. 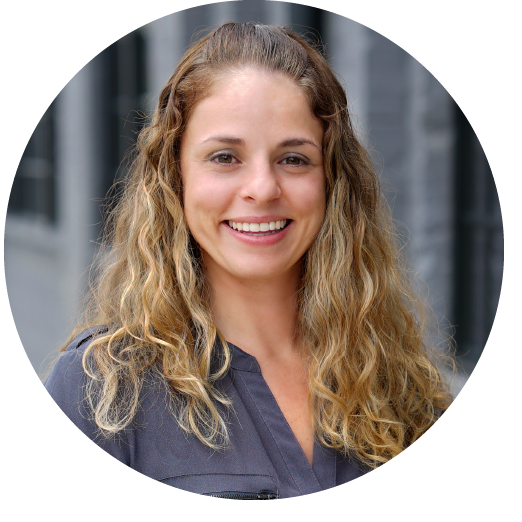 Knowing they wanted to develop an eCommerce site to use as a loyalty program, but unsure of how to begin, they turned to Groove for help. This project had one main goal: Create a branded rewards program that was easy to use, had an engaging design, was mobile responsive and did not interfere with the customer’s purchase path. 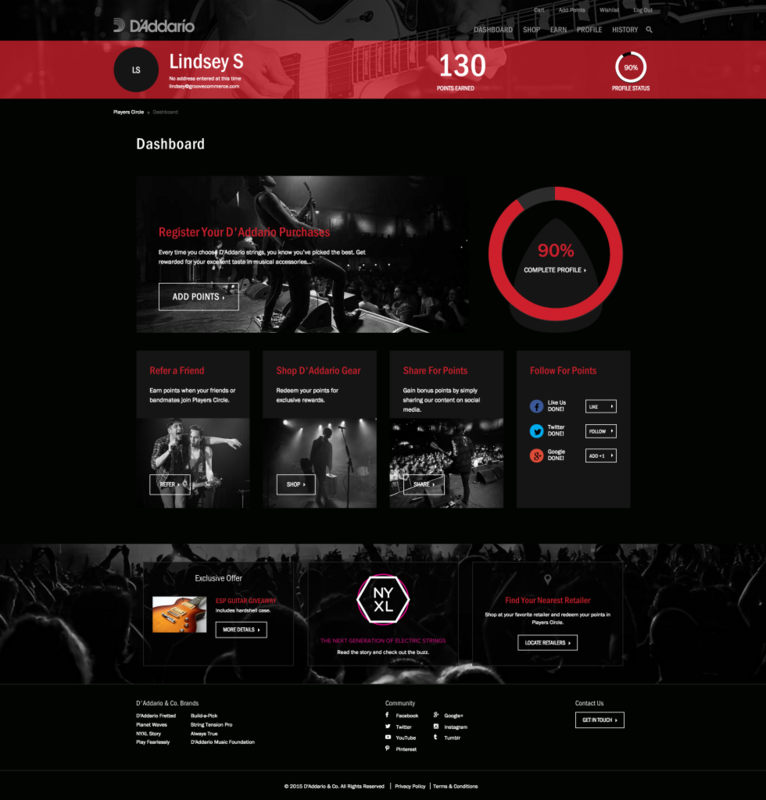 After assessing D’Addario’s needs, Groove went to work to create D’Addario’s digital loyalty program, the Players Circle. We used Magento Enterprise and Smile.io to power the eCommerce catalog, but instead of having the user pay with dollars, they instead pay with points. Customers can now seamlessly register their purchased products and instantly receive points that they can use to redeem from a list of rewards. To allow customers to redeem specific points for certain product values, Groove created a custom functionality for D’Addario. By building this serial number program, we could take each product’s serial number and establish a certain point value that customers could then use as a way to earn points and claim rewards online. Going into the design process, it was important to create a simplistic design with an intuitive user experience. Leveraging great product photography and brand guidelines, we created a sleek design that complimented their main website and was easy to use across any platform or device. When it came to the homepage specifically, we wanted to create a strong first impression that would “wow” new users when they first entered the site. Taking on a minimalistic design approach was key to highlighting the simplicity of the customized site. We wanted it to be easy for users to explore the site and to learn more about the program. One of the key aspects of the design was focusing on the account dashboard. This customized Magento Customer Account section acts as a personal profile for each user, with the ability to track your status and behavior through your individual experience as a member of the Players Circle. Once you sign in to the account, the profile bar can be seen anywhere as you navigate through the site. 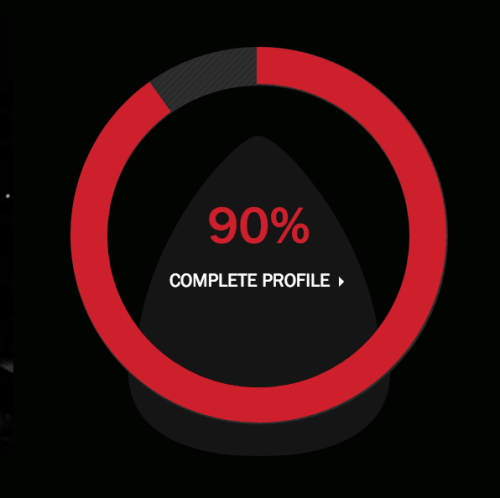 The profile bar highlights your points earned and what percentage of your profile you’ve completed to act as a constant reminder to earn more points to redeem rewards. Throughout the site, our Creative Team added personalized touches like the guitar pick outline behind the “Complete Profile” CTA, as well as the colors used to make action items stand out. As a platform focused on strengthening the relationship between D'Addario and their customers, this is just the beginning on what this comprehensive system can provide. Both teams are focused on user engagement moving forward, and are leveraging a variety of tools to help measure user engagement with the site, such as Hot Jar and Crazy Egg. This innovative program arrives at the intersection of loyalty and eCommerce. This initiative will ensure that D'Addario can develop and strengthen a relationship with its customers moving forward, while not disrupting their sales channel. This level of engagement and the opportunity for continuous interaction is a major step in furthering the customers’ loyalty to the brand and provides numerous opportunities to drive revenue through additional purchases.